Starting this month, I'll be reviewing a LEGO set each month, and you (yes YOU) get a chance to win it. More on how to enter towards the bottom of this blog post. This month's set is LEGO City: Fun in the Park - City People Pack. It retails for $39.99*, but is well worth the price because of a few extras that are new to the world of LEGO, and some others that are just downright fun. *as of March 7, it's on sale at Amazon for $30.97, which is totally a good price and worth buying just in case you don't win the drawing, even though, knowing you, you probably will. In my book Play Like a PIRATE, I mention that I don't usually use minifigures for classroom use. Minifigures and specialty pieces like wheels and wings are the things that students are most likely to fight over. Probably not a knock-down, drag out fight. Probably the kind of fight that happens in the back seat of my car on road trips AND I SWEAR I WILL TURN THIS CAR AROUND IF YOU D-- where was I? Oh yeah. LEGO. Where I usually am, to be honest. So I don't usually use minifigures, but they do come in handy for certain projects. Fun in the Park gives you fourteen minifigures. Seven male, seven female. Plus, for the first time ever, a minifigure baby of indeterminate gender. And it's the cutest thing you've ever seen, you guys. Plus, a little disturbing. Oversized head, tiny arms, huge eyes. ...like a regular human baby, I suppose. So you get fifteen little plastic souls in this set. Plus a dog. Dogs have souls. So we're up to sixteen. The baby is cool. The baby is legit. But the other brand new piece that makes me even happier is a wheelchair. How LEGO, a pretty progressive company, has made it until 2016 without producing a special wheelchair piece is beyond me. Yes, you could build your own, if you have the right pieces and skills. But I've played with my share of LEGO, and I'm guessing I have around 300,000 pieces and no I'm not kidding I have a problem please send help. But I've tried to make a wheelchair on several occasions. For DC Comics' Oracle, for Marvel Comics Professor Charles Xavier, for freaking FDR. But every attempt has fallen short of some reason or another. And if I struggle to make a good wheelchair, so would a lot of kids. Adding a wheelchair to the world of LEGO is a huge step forward (roll forward?) and it's going to let thousands of kids see themselves or their family members in the world that they spend a lot of time in. The wheelchair is also included in a Ciy set coming later in 2017, which features a wheelchair accessible bus. Among the fourteen minifigures are four kids (with shorter leg pieces than the usual minifigures), an elderly couple (the grandmother looks a lot like my mom)(go Mom! ), a businesswoman, and a hot dog vendor. 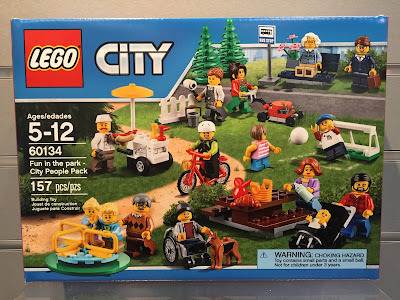 Besides the minifigures, there are several small builds: a bus stop, a merry-go-round-of-the-sort-that-is-no-longer-considered-safe, the hot dog cart, soccer goal, and a picnic table. And then accessories like trees, a bike, lawn mower, and stroller for the Baby Of Indeterminate Gender. This is a great set. For home, for school, for adding to the population of my LEGO Room. 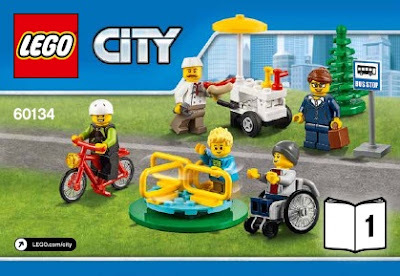 I like the 1:1 ratio of male to female, I like that women are shown in occupations, I like that the kid in the wheelchair looks happy and cool and his hoodie looks like the one I'm wearing RIGHT NOW. 1. Use minifigures to study statistics. If you have a critical mass of say, thirty minifigures, use them as a census. Have students each select a minifigure and write down certain characteristics for their character. Gender, age, political affiliation, religion, occupation, race (if you want to go there), household income. After they have that information down, have the students compile the data and find ways to represent it in tables and graphs, and make predictions about the needs of that community. What are their needs today? What would their needs be twenty years from now? 2. Who's missing? Looking at the Fun in the Park set, we see that there are certain groups represented for the first time: infants and disabled. Although he may not be "disabled." He could be differently-abled, or just in the wheelchair for an injury, like when I broke my foot in summer of 2015 THE DAY BEFORE GOING TO LEGOLAND. In any case, he's got wheels for now. The elderly couple is also relatively new to the LEGO world, just appearing in the last ten years of sets -- and the short legs on the kids have only been around since 2002. Which is about how long my own kids have had short legs. So considering those characters -- who's missing? Have students assess the minifigures in the classroom, and come up with one recommendation for a character that should be made in minifigure form to more accurately reflect their community. Would it be a different gender? Race? Ability? Age? Occupation? Students could come up with an evidence-supported argument for why that minifigure should be included in a future LEGO set, and how it would represent that community. They could use the simple minifigure template to design what that minifigure would look like, and make a presentation about their character. 3. Story starters. Have students draw two minifigures blind out of a bag (hat, boot, boa constrictor) and come up with a story about the two characters meeting for the first time. Or going on an epic quest. Or opening a new business together. Or founding a cult. Or coming up with a new two-person sport. Or founding a cult. I know I said that one twice, but I really want to see some fourth graders starting a cult. You know you do too. In any case, having just two minifigures is enough to get kids thinking about a story that would bring those two characters together. SO AFTER ALL THAT BLAH-BLAH, INCLUDING THREE GREAT IDEAS FOR USING THEM IN THE CLASSROOM, HOW DO I ENTER TO WIN THIS AMAZING SET??? 2. Subscribe to the monthly Play Like a PIRATE newsletter. It started this month, and will come out once a month, with ideas for the classroom, a graphic novel review, and a review and chance to win the new LEGO Set of the Month. No spamming (beyond once a month), no selling your emails to anyone. I don't even know who I would sell them to. It may be worth investigating. 3. Follow @jedikermit on Twitter, and retweet this tweet. If you're not on The Twitter, you really should be. Sign up just for this entry. And follow me. So worth it. You can follow the #PlayLAP hashtag to see what other people are doing with Play Like a PIRATE. A book you should totally buy. Some fine print: the LEGO Set of the Month will only be available to U.S. residents. Even though I love everyone on the planet, international shipping is beyond my reach right now. The drawing for the March LEGO Set of the Month will be at 10 AM MST on Friday, March 17. The drawing will be taken from all eligible entries with a random generator. So hopefully you win. Yeah, you. UPDATE: BRANDI METTS WON THE LEGO SET OF THE MONTH -- STAY TUNED FOR APRIL'S SET. YOU'LL LOVE IT!